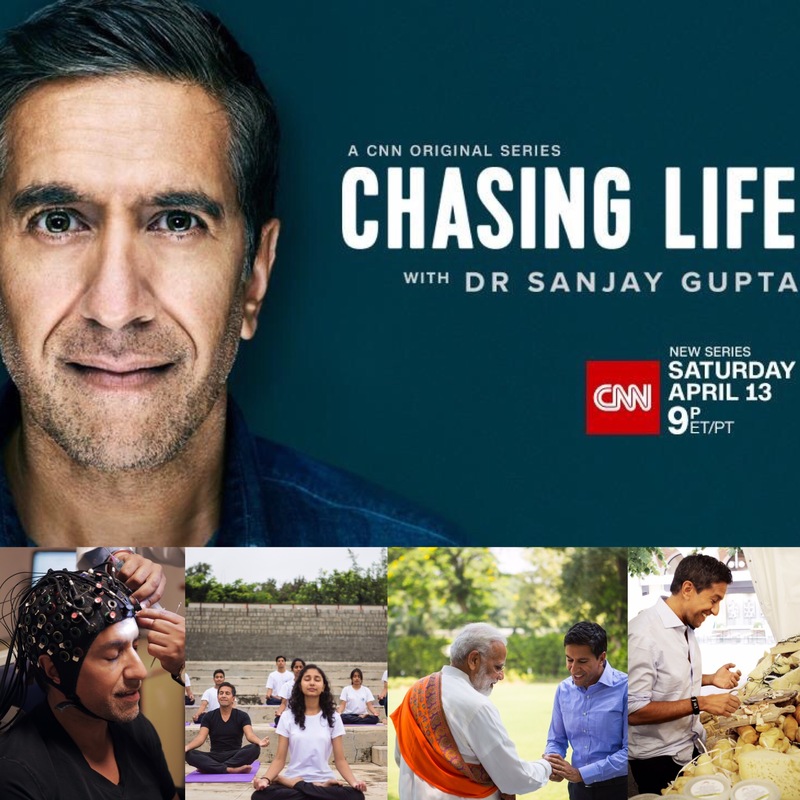 In his new CNN original series, Chasing Life, Dr. Sanjay Gupta, a neurosurgeon, and a global correspondent, explores the distinct practices around the world to bring us the secrets to longevity and help us better understand overall wellbeing in the long term. He travels to Bolivia, India, Turkey, Japan, Norway & Italy in this six-episode series. I had a chance to chat with him about his new series and the overall connection he is trying to make between health and happiness from his travels to these diverse parts of the world. 1. What was the inspiration for the show? I think as a person who has traveled all over the world and as a doctor, what I have realized over the years is that there are important and interesting things happening in health around the globe. I think, a lot of times we as Americans tend to get precautious and isolated in terms of how we think about healthcare because in some parts of the world, healthcare is not just the avoidance of disease. When you get to explore and understand how people in certain parts of the world approach healthcare there is a lot to explore about how these people lead happier lives, healthier lives and more productive lives. There are lessons to be learned about how these health practices are incorporated into their daily lives. This was an opportunity for me to travel and see these things and experience them firsthand. 2. What surprising things have you learned from this journey? The idea that you can do so much with so little when it comes to healthcare and how health is incorporated into their daily lifestyle was surprising but also very inspiring. When I was in Bolivia and lived in the Amazon rainforest for a while, I heard about a tribe that had no evidence of heart disease and wanted to explore further about this claim. One of the things that I learned from my travels to Bolivia is that our own immune system is contributing to a lot of disease. In the developed world, we live very clean lives in the pursuit of good health but that can backfire on us in terms of living with various organisms in the body that could help us, such as parasites. We are also learning that they do not have evidence of diabetes and dementia and this is an indigenous tribe compared to United States, that spends trillions of dollars on health care every year! There were two other things that struck me, one thing was if something lasts around thousands of years it’s worth looking at. The other thing was this concept of Ayurveda and the Ayurvedic diet was created to find foods that had a function. It really is food and medicine compared to the western diet, which is centered around our palette and what strikes our palette may often not be good for us. The concept of finding foods that are good for you and making it tasty vs finding something tasty and hoping it’s good for you is a fundamentally different way of thinking about food. Also, if you see the episode in India, in places like Kerala women using Kalari (Kalaripayattu) martial art techniques as a form of exercise and self-defense is very emblematic of what is possible in terms of change and empowerment. Women in this part have some of the highest literacy rates in the country and this is a success story and its worth telling this story for lessons to be learned by the rest of the world. We all carry these longevity genes inside of us, such as the FOXO3 gene and what the research is showing is that these genes need to be activated and foods like bitter melon that is eaten by centenarians in Okinawa, Japan , where diet plays a central role could help activate those genes. 3. Do you think learning about these practices can lead to better medicine? I think this is clearly where science will direct itself. After the episode in Japan, we received many calls from people in the world of therapeutics asking about other ways to activate the FOXO3 gene. People always want the shortcut, but the reality is many of the ingredients that we need to live healthier and longer lives already exists and are part of the earth. When I speak about the potential of parasites, as I saw in Bolivia could help cure heart disease it might not be touted as a popular treatment, but people are now looking for ways to nurture our very own microbiome and some wonderful and surprising answers are already there. 4. Does climate and environment play a large role? I think there is certain types of food that grow better in certain environments. The world is changing, and the nutrients in our food is an objective measure of how the environment has changed. A bitter melon today is different from a bitter melon that existed several hundred years ago. I think that is worth knowing and measuring. 5. How has your perspective changed after this overall journey? I have always had a global perspective on health. I probably, live my life differently now in terms of how I approach stress and to see objective measures of that is interesting. I am also a neurosurgeon and if I can go and explore these methods then I can also help my colleagues in the medical field understand these connections better as well. We don’t always need to look for the most complicated solutions for some of these problems as there are simpler solutions that lie in front of us and sometimes, they don’t require any innovation as so much of it come from the earth itself. 6. A message for the younger generations? Young people, I think sometimes have a better approach to healthcare, but they do not always know who to trust and find better content and this show can hopefully provide some of those answers and be a trustworthy source.